Misc: 2 Bedroom, 2.5 Bath Resort Property with 1300+/- sq. ft.
Portofino Condominium home for sale in Pensacola Beach Florida – an amazing resort property with everything you need to enjoy the best in the popular coastal lifestyle. This Pensacola Beach condominium home is for sale by owner, offering 2-BRs & 2-BAs – spacious enough for a family with plenty of seating at the dining-table, plus stools for dining and socializing. With split-bedrooms, this resort residence offers plenty of privacy and comfort. Relax on the private balcony or entertain family & friends as you enjoy the amazing views from the Portofino home, including the Santa Rosa Sound. 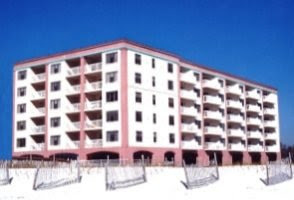 This Pensacola Beach FSBO condo is being sold furnished, including full-size clothes washer/dryer, fully equipped kitchen, a large flat-screen HDTV and more. Life’s a Beach at Pensacola Beach, where the sub-tropical weather is warm and body surfing & beach-combing are common pastimes. Away from the sands, there are numerous sights for the entire family, including the National Aviation Museum, which features 150 vintage aircraft, flight simulators and an IMAX Theatre and Fort Pickens, a historic military fort built in 1829, and the Pensacola Lighthouse, the oldest lighthouse on the Gulf Coast and also the tallest, standing 151 feet tall on a 40 foot bluff. Of course, there’s an abundance of outdoor activities like deep-sea fishing and water-sports such as sailing, kayaking, diving and snorkeling to be enjoyed. Find the Pensacola Beach homes and start enjoying the best in coastal living.